Being a bike messenger in New York City is an ill-advised and dangerous enough profession without being caught up in a plot involving Chinese gangsters, a corrupt cop with a gambling addiction, and illegal immigration. Such is the lesson Joseph Gordon-Levitt learns in Premium Rush, an entertainingly frenetic bike messenger Road Runner chase picture, complete with Gordon-Levitt's character being named Wiley. As in Coyote, several characters make sure to point out. Anyway, Gordon-Levitt could have gone to law school but he doesn't like to wear suits (he should try a Batsuit). He loves to ride, so much so he works for peanuts weaving through deadly NYC traffic on a bicycle he modified to have no gears and no breaks. 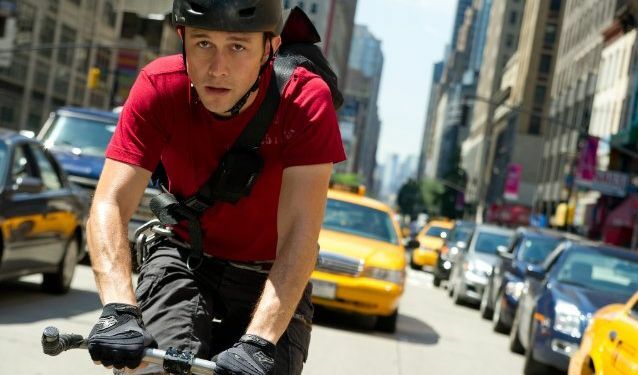 Gordon-Levitt is such a born bike messenger, he even has Bike Messenger Spider-Sense, that allows him to slow-motion anticipate every possible crash scenario in traffic and choose the safest route so he never has to slow down. Tasked to deliver an envelope from Columbia University to Chinatown in 90 minutes, Gordon-Levitt finds himself chased by Michael Shannon, the aforementioned corrupt cop with a gambling problem who owes thousands to Chinese gangsters. Shannon is a scene-chewing trip; he introduces himself to everyone as "Forrest J. Ackerman" but his real name is the equally awesome Bobby Monday. (He also has a third name, "Douchebag", given to him by Gordon-Levitt.) Shannon wants the envelope in Gordon-Levitt's possession, but Gordon-Levitt is too much of a professional to hand it over. Hence, several increasingly absurd chases throughout Manhattan, involving cars, multiple bicycles, and even a "flash mob" of bike messengers. Premium Rush is amusingly stacked with geek cred: What we have here is John Blake from The Dark Knight Rises being chased by General Zod from the forthcoming Man of Steel, while lending support are Dania Ramirez, who was Callisto in X-Men: The Last Stand and Maya from Heroes, and Jamie Chung, who was one of the girls in Sucker Punch. I just wish Wiley used his first name - Robin - instead. It's pretty. But let there be no doubt Robin John Blake can carry a bike messenger action movie. Smallville: Season 11 #15 - "Detective"
Smallville: Season 11 #14 - "Detective"
Smallville: Season 11 #13 - "Detective"